Long Overdue Update, New Pics! we are in the middle of round 2. 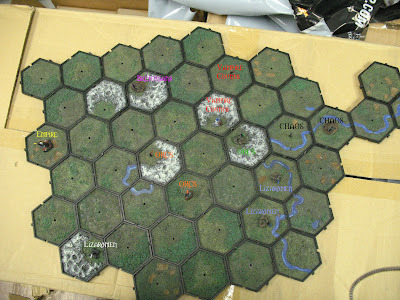 After terrain placement, but before deployment, the player selecting this strategy may re-place (meaning re-deploy) up to two pieces of terrain already placed in any matter he/she sees fit. Pick one player. They must roll a D6 for each Castle, City or Mine. On a roll of 1 the place is destroyed. You receive an extra two points this round as long as you don’t lose or draw any battles. IF you lose or draw you don’t receive any points this round. In any battles you fight this round, your opponent must deploy there whole army before your army and you get first turn. Pick one player, they may issue any challenges against you this round. Increase character item caps, you just don’t have to pay for the items. Observatory- Empire army gain the "Scouts" campaign event rule. If the opposing player has the Scouts rule that turn, "Scouts is nullified for both. Grail Chapel- Give "Blessing of the Lady" to all Bretonnian Knights removes opposing player getting 1st turn option. Arcane Ruins- Spellcasters ignore first miscast. Round time ended, both players take loss. Finally I get these posted, I had a super busy time this month and trying to get a variety of hobbying done was pretty tough. I had a least a week where I didnt touch a thing this month with my daughters 1st birthday, and Thanksgiving both within a week of each other. I had been telling people I had a update coming so this is it. My Empire Army as it stands, I have 57 models painted which is just about 1/2 of the Army. 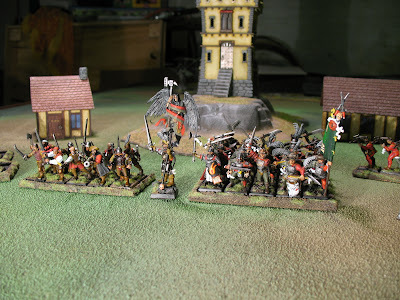 This is big month for me, I need to get 12 cavalry models done this month at a minimum to stay on track to finish by early March in time for Adepticon 2008. Other news we started a new campaign at the GW, Oak Park store. This one is bi-weekly so we have alot more time to get games in. Same crew as before,with the exception of Felix and his Wood Elves who are bogged down with real life issue ( hopefully we can get a game in soon bud!) Some new faces in this campaign, and we expanded the Mighty Empire rules a but with race specific buildings, new event strategies and actually making gold useful. I am looking forward to it. We've played the 1st round so far and my Empire lost to Bill Lim's "Army of Sylvania" really tough game. Still not sure how counter that VC army but I am working on it. I will post a new campaign log for the first two rounds either tuesday night or wednesday, with all the new rules, players, games results and the map! 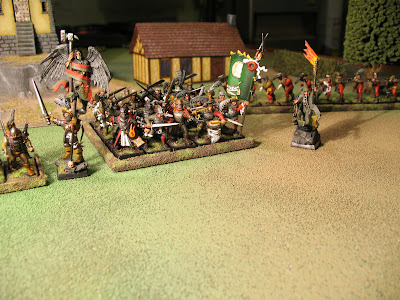 Free Company, Captain who is the Battle Standard Bearer, Block of 24 swordsmen with a Warrior Priest and my Wizard. Crossbows in the rear on the right, note one of the new fantasy building by Armorcast in the back as well as the pre made GW trees and hedges. I needed more trees for my table and although I have 3 of the new citadel wood kits, they are really time consuming, I only have one done and second base done, when I'll have time for more I don't know. The Handgunners are on the far end in two ranks. what I have painted now is still only about 850 pts. Once my next project of finishing my knights and my General, its will over 1250. Another Armorcast building in the rear there. I have my whole 2250 point army built, based and primed right now with the exception of a final ten Flagellants, I've actually built more stuff than I need as I keep changing things around with different armies and point totals of the Campaign. For instance I doubt any archers at all will make my final list and I have 10 built, Jeff W, gave some 6th ed Spearmen which might make an appearance soon. I need to start playing 2250 regularly at this point, and make some final decisions. I may need to make few trips out the bunker on our campaign off weeks and try my hand at some other local players. 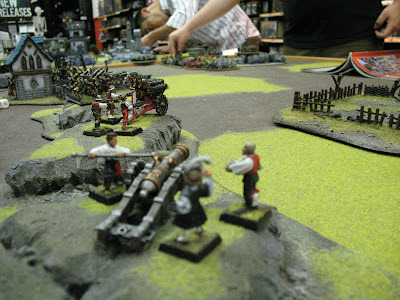 A Mighty Empires Campaign, 10/30 @ Games Workshop, Oak Park. The end of the Empire line, seen from my last piece of artillery on my right edge of the board, note the dwarfs- all the way in far corner. I was suprised to come in second place with an overall 3-2 record. My wins were all solid victories and my losses were a massacre by the Vampire Counts and marginal victory held by the Orcs and Goblins. fortunately my campaign strategy event of "land grab" fell on a losing week so it allowed me to get an extra territory, and when I had the "building boom" strategy event I managed to win that week giving me a free city upgrade while I used my 4 points to grab two more territories. Without those two events I would have ended up with only 6 points. 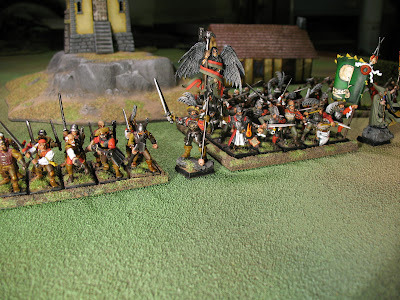 This was the first time I had gotten a chance to play many of the armies here, like the Lizardmen and the Vampire Counts so I learned a ton about the practical pro's and con's of the Empire and what works for men and what doesn't seem too. I will continue to tweak my lists for the upcoming campaign as this is great practice for Adepticon. strategic and interesting. I am going to lay out some thoughts see what we can agree on as group for the next round. Battle Recap- Round 5- Empire vs Dwarfs 2000 pts. 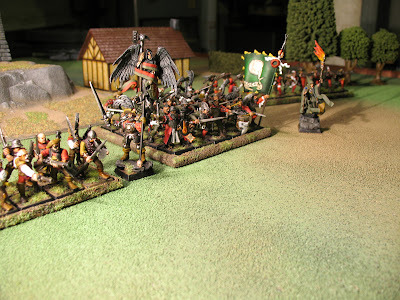 My last match was versus the Dwarf army and I had the "elite army" campaign strategy which allowed to field a list that I certainly never would normally run, containing 6 special units and 2 rares. My list was the standard with the exception of I am now using Greatswords. I also had 3 cannons, Pistoliers, 2 Hellblasters, and upgraded my knights to "inner circle" making them a special unit. One the reasons I don't like "Elite Army" is it breaks the standard force organization chart and thereby giving you a large advantage over your opponent. I like the idea of campaign strategy events giving each side some kind of strategic bonus on the map, but this one gives you a direct effect on your match and really unbalanced one at that. Having said that, I had expected my opponent Billy to be maxing out his specials and rares as a result (and he been running 4 cannons and an organ gun in several past rounds) so I didn't feel "too dirty" running this list. The kicker was Billy ran an army completely opposite of what I had expected but it was almost the identical army I had just played on thursday against another local guy the previous thursday. What people call the "Strollaz's Squeeze", using the Strollaz's rune on big blocks of troops with Dwavern miners in reserve. This gave his army a free move before turn one with the miners popping up behind your deployment zone in turn 2 and putting you in a deadly squeeze quick. Its is very effective and the guy that ran it against me thursday massacred me with it. In effect I was ready for the standard Dwarf gunline army, but mentally prepared for the Strollaz's Squeeze in any case. The Dwarf army was essentially a blocks of warriors, rangers , Ironbreakers and a unit of Slayers with a group of Thunderers in the backfield and the Miners in reserve. with a Thane , a Runelord and tons of upgrades for all. Billy deployed all the way in his right corner as tightly as possible while I was forced to deploy all the way across my edge of the table. This was good and bad. 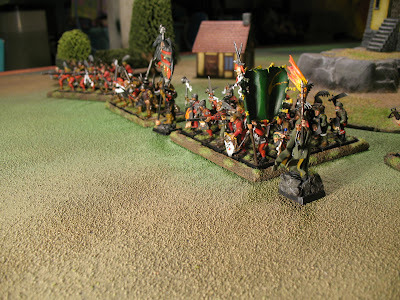 It was bad in that my Handgunners, 1/2 my artillery, flagellants, and my crossbows, weren't going to see much in the way of action but it was good in the fact I was sure they were going to survive the game and I was going to claim that table quarter. So I had about 500 points of units and 100 VP that headed my way at the end of the game, they just werent going to have much effect on the match. I'll break the game overall into reviewing each phase from memory as I didn't take notes this game, I wanted to concentrate on playing. Magic Phase- If you played Dwarfs before you realize the magic phase is joke, my wizard was beyond useless, and this was one time I should replaced with an engineer hero who could have helped some of my crappy artillery rolls in the game. Magic was a non issue, I did get on spell off 3 times but Billy had 3 dispel runes. never had much in the way of a target all game. in retrospect I should have started marching my handgunners turn 1. Close Combat- What it all came down to. As I said my Pistoliers got squeezed, my Knights broke, rallied- charged again versus his Dwarf Warrior brick wall, broke again and fled off the table. My swordsmen polished off the Dwarf Rangers and captured their standard but when in combat with his slayers and Ironbreakers, broke and got overrun by dwarfs! !, overun by dwarfs??? weak I know. Anyway all these pursuits set up a huge flank charge for my greatswords and General who with the warrior priest in the unit gave had "hate" and "stubborn" as effects. I managed to whittle down the slayers, win combat and break the ironbreakers during his turn that was the top of 6, meaning he had no chance to rally and I got the points for the whole unit even thou they had taken a couple of causulties. 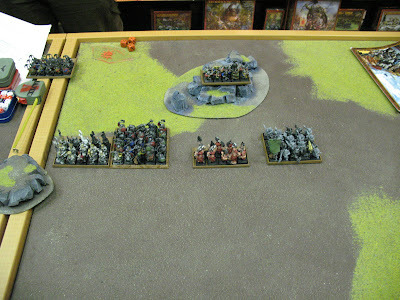 That unit with the hero was worth close to 500 points, bad time to break for the dwarfs. My Greatswords never took a causualty and General came up with some big saves avoiding any damage from numerous attacks im the game. when the smoke had cleared with all the other unused stuff on the table I was up +751 points and a solid victory. Overall- I think this was my toughest game yet, mentally as well as the back and forth that went on. When my swordsmen broke and where overran I lost both a battlestandard, my normal standard, and the captured standard I had. They werebasically a full unit and my main block so I thought the game was lost right there. Thankfully positioning was key for the Greatswords to take advantage and allowed my General to join in. Take those fleeing Ironbreakers at the end of game out of the score it and it was a marginal victory at best . tight, tight match regardless of score. Good game to Billy.